10% Off First Orders with Newsletter Sign-ups at Manchester United Football Club You can save 10% off your first order just by signing up for the newsletter! What's not to love? Exclusive £5 Gift Card with Orders Over £70 at Manchester United Football Club Spend over £70 at Manchester United Football Club and get a £5 gift card of your choice. Once your purchase has been verified we'll email you how to claim. Free Standard Delivery on Orders Over £100 at Manchester United Football Club Get your order delivered for free when you spend £100 or more at Manchester United Football Club. 2018/2019 Home Kits from £14 at Manchester United Football Club Show how big of a fan you are with the Man U home kit! Shop now and find pieces from £14. Find 50% Off in the Clearance at Manchester United Football Club - Kit, Gifts, Souvenirs and More Shop the Manchester United Football Club clearance and find great products for less! 2018/2019 Away Kit from £10 at Manchester United Football Club Support your team at their away games dressed up in the away kit! 2018/2019 Third Kit from £18 at Manchester United Football Club Get your hands on the third kit from just £18 at Manchester United Football Club. £5 Off Selected Homeware at Manchester United Football Club Show how loyal you are to your team with Man U homeware! Take a look at their range of bedding, mugs, coasters with a discount today at Manchester United Football Club. Souvenirs from £2 at Manchester United Football Club Take a look at the fantastic souvenir range at Manchester United Football Club from just £2! Personalised Gifts from £3 at Manchester United Football Club Get them a gift they'll love from the personalised range at Manchester United Football Club! With prices from £3, there's something to suit every budget. For the avid Man United supporter, you can get kitted out to the nines at UNITED DIRECT. Rounding up the goods to help fuel your enthusiasm for one iconic team, this is where you will find clothing galore, as well as accessories, gear and more to keep you looking and feeling sharp when you’re watching the game or partaking in a knock about yourself. Find a Lingard 14 shirt here, alongside a pair of Cup Training shorts or a coaches presentation jacket - these are the goods that will help turn your dreams of being on the pitch into near reality. Browse souvenirs to find a little memorabilia of your favourite football moments, a novelty toy, teddy, or take a look at homeware to get the little supporters amongst you a duvet set or team flag. When there are goods available for men, women and kids too - the whole family can get involved and make some noise for Man United! How do I use my UNITED DIRECT discount code? Sign in or create an account to continue and complete your purchase. Sign yourself up to the UNITED DIRECT newsletter to save 10% on your orders and to stay in the know about competitions, exclusive offers and much more! How long is delivery for personalised UNITED DIRECT goods? You should add 3-5 days on to the usual delivery time indicated should you have ordered any personalised products. Can I buy UNITED DIRECT gift vouchers? United Direct doesn’t currently offer gift vouchers, but you can be sure to find plenty of gifting solutions for a Man United supporter and you can choose to add gift wrapping to most purchases too! What size apparel should I order from UNITED DIRECT? There is a size guide online to help you choose the best fitting goods for you or a lucky recipient. 30-days returns or exchange policy on items in their original condition. Personalised goods may be returned if faulty. 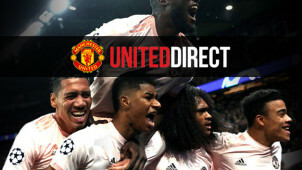 For the official Manchester United merchandise, look to UNITED DIRECT. The online megastore is packed with everything you need to add to your wardrobe, home, even car and office space so that you can sport true dedication to your team. A Man UNITED DIRECT discount code will let you save on a home kit, training shirt or jacket and much more. For leisure wear or for when you’re on the pitch too, you can find the goods to make you feel 110% part of the Manchester United team spirit. You can personalise many of the goods available at UNITED DIRECT to let you make each of your acquisitions even more special. Letting you be your favourite hero when you can get your favourite player’s name printed on your Man UNITED shirt or full on kit. Perhaps you want to put your own name on it? Perfect for yourself or to gift another Man United fan friend - with options for kids, men and women alike - everyone can get the Man United experience they’d like. When you want to support your favourite player on the Manchester United team, you can’t go wrong with getting a kit to make you feel like you’re really part of the action. Choose from a home or away kit, one for the goalie, or the thirds - with Man UNITED DIRECT voucher codes you can save on whichever one you’d like. Choose by player and transform into Romero, Rooney, Ibrahimovic or your other hero - whoever you want to be - now you can with UNITED DIRECT.